After the less than warm reception for Assassin’s Creed: Unity and Syndicate in 2014 and 2015 respectively, Ubisoft decided to put the franchise on hold for an extra year, giving Ubisoft Montreal four years to craft a new direction for the series after they concluded their work on Assassin’s Creed IV: Black Flag. The care shows. 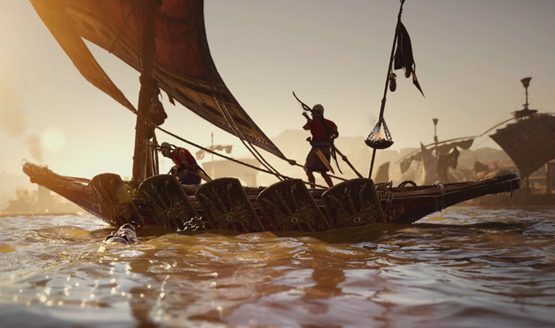 Assassin’s Creed: Origins will appear familiar to longtime fans, but enough has been reworked to give the assassin brotherhood a much needed shot in the arm. One of Black Flag’s most interesting aspects was approaching the story from a different angle. Edward Kenway was not an assassin, at least in the proper sense. His story explored the conflict with the Templars from an outside perspective, which provide not only unique narrative opportunities, but also the chance to change up the gameplay. In Assassin’s Creed: Origins, Bayek is not an assassin, at least not to start out. Origins will bring to light the humble beginnings of the brotherhood, steeped in a dark themes that aptly carry the weight of a centuries long contention. Dropping me into the open world, I had the opportunity to do some exploring and take on a story mission that highlights these dark motifs, resulting in finding a child’s body in a most horrifyingly somber of ways that really had a strong impact on me as I played the scene. If Origins continues with these very grim moments as the driving force behind Bayek founding the assassins, this will be the most engaging and emotionally chilling Assassin’s Creed game we’ve ever seen. Story will have to come when it releases later this year, because the primary goal of this demonstration was to get a feel for the gameplay. The changes in Origin’s combat are drastic enough that I was felled more than once as I tried to get a feel for the new control sensibilities. Once I got the hang of it, I still didn’t think it flowed in the same way previous games have, but this particular style may be to better fit some of the new RPG aspects of the game. It may also be that I simply not used to this design, but I’m hoping to be presented with a much stronger reason for this change to fundamental and familiar combat controls in the final game. The massive world is enormous and detailed, giving players a radically different environment than they’ve ever seen in an Assassin’s Creed game before. Even the E3 demo was tickling that neurotic nerve of mine that wanted to run out and complete every mission or collect every item. It was almost too much to take in for the brief amount of time I was able to get my hands on the game, if that helps to relay the scope that Ubisoft Montreal is aiming for. If you’re a fan of Assassin’s Creed games, you’ll find plenty to love as a reason to come back. If not, there may be enough changed at a deeper level that you’ll be able to get over any animosity you have for the series in order to embrace it as a really solid open world game.